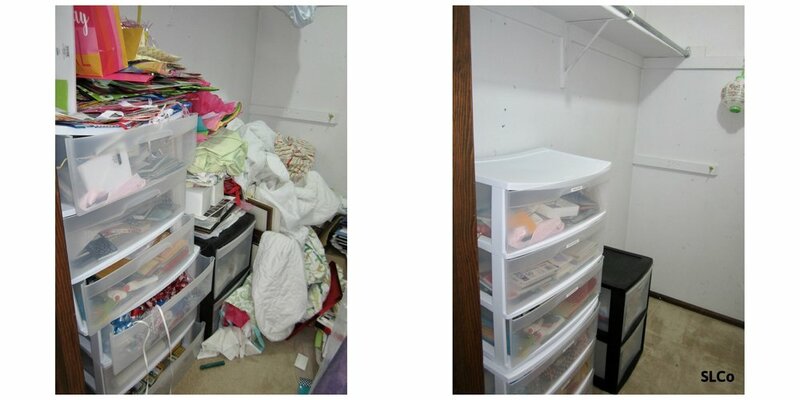 Lakewood Master Closet 1/4: This client had become situationally disorganized and didn’t know where to begin. I loved seeing the transformation for not only the space, but also the client! She was very dedicated to getting her Master Closet organized again! Master Closet 1/3: This closet was a major source of stress and frustration for my client so she was really focussed and determined. She did a great job making decisions on what she wanted to purge and keep. This project took about 4 hours to complete. Master Closet 2/3: My client did an excellent job going through her clothes as I organized her master closet. Master Closet 3/3: My client did a thorough purge! I brought these donations to a local thrift store called the Treasure Trunk where proceeds benefit domestic violence shelters. I mailed the tax receipt to her so she'd have it for her records. 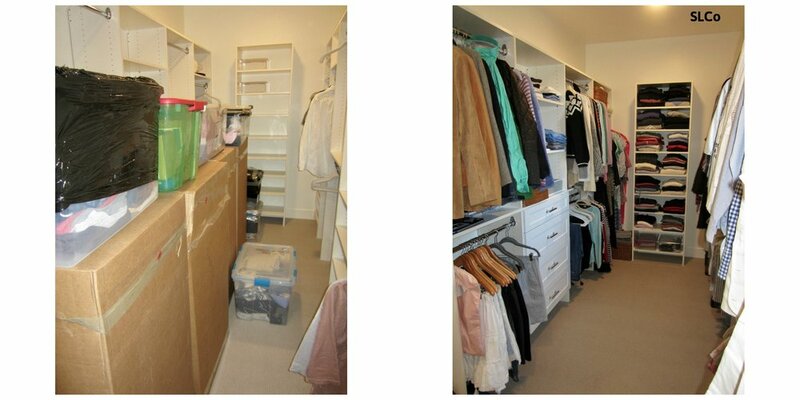 Cherry Creek Master Closet 1/3: This client moved into her new space the weekend before our session. She’s now all settled and making the best use of her new space! Denver Unpack 1/3: This client hired SLCo to unpack their spacious new home. By hiring us, we saved she and her family so much time and stress! They were settled into their new home in a matter of days instead of weeks! Denver Unpack 2/3: It was a bit of a challenge to get good “before” photos because of the amount of boxes in the closet waiting to be unpacked! Denver Unpack 3/3: Master closets can be one of the most time consuming areas to unpack. With the help of Streamlined Living Colorado, this client was able to work on other areas of her new home while leaving this daunting task to us! Littleton Front Closet 1/2: This closet was making my client feel anxious (which is SO common, believe me! ), so together she and I purged and reorganized it! And SLCo hauled away donations to be donated to the Treasure Trunk Thrift Store! Littleton Front Closet 2/2: Now every family member has their own basket for things like mittens, gloves and hats! Denver Utility Closet 1/2: Decluttering and sorting like with like allowed for so much more storage in this closet. Denver Utility Closet 2/2: Decluttering and sorting like with like allowed for so much more storage in this closet. Centennial Move Prep 1/3: This client contacted me at the advice of her Realtor to get the house prepped before listing photos were taken. Now this guest room closet is camera ready! Centennial Move Prep 2/3: Streamlined Living hauled away a car full of hard-to-recycle items and brought them to SustainAbility Recycling. We also arranged for dresses to be donated to Bella Boutique and brought the other client donations to the Treasure Trunk Thrift Store. All of these services are included in our prices and we do this for EVERY client after every session! Highlands Ranch Post Move Unpack: This client hired Streamlined Living to get her teenage daughter unpacked and settled after a recent move. The post-it notes on the bins are meant to be temporary until her daughter can get the “lay of the land”. DTC Guest Room Closet 1/2: Sorting the seasonal clothes to be stored in the guest bedroom made a world of difference for this client! Utility Closet 1/3: Looking for the cleaning products and other commonly used household items should be quick and easy for this family now! Post Move Organizing 1/3: My client requested that her husband be able to see all of his clothes. Mission accomplished! Denver Master Closet It’s much easier to find what you’re looking for in your closet when the clothes are organized like with like! Scarf bin 1/2: Scarves were piled high in this client's bin. Rolling them and standing them up in the bin allows for each one to be seen. Scarf bin 2/2: What a difference! Storage Closet: My client and I unpacked and organized a few boxes that remained after they moved into their new home. It took us about 2 hours to conquer this closet! Storage Closet: A purged and organized storage closet! 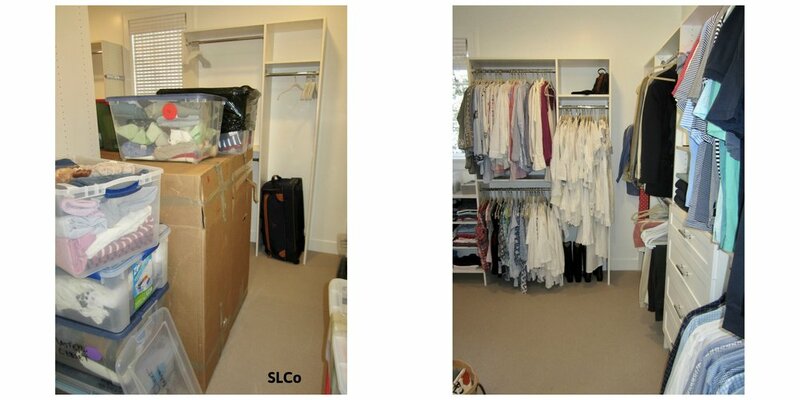 Master Closet 1/4: This client was determined to transform her closet! She was very committed to purging and decluttering! Master Closet 2/4: This client did a fantastic job staying focussed on the project. Master Closet 3/4: Her closet is no longer a source of stress for her! Master Closet 4/4: And purge she did! All of these items were donated on the client's behalf and she received the tax receipt. Home Office Closet: Creating designated zones in this closet allowed for maximum storage solutions. Denver Closet: This wardrobe purge was handled a little differently than a "traditional" purge. My client was suffering from chronic, severe back pain so she stayed put on the couch while I brought every item to her from her master closet. From there, she chose what to keep and what to purge. Streamlined Living is happy to accommodate the client in any way we can! Master Closet: This client hired Streamlined Living because she did not know how to best use the space in her newly renovated closet. Linen Closet: My client thought she wouldn't have much to purge from this over-stuffed linen closet, but once we went through everything, we discovered several sets of sheets and blankets for twin beds yet they hadn't a twin bed in the house for several years! With my client's approval, I dropped off her purged bedding and towels to the Denver Dumb Friends League on her behalf. What a win-win!! Spare Bedroom Closet: My client went through 15 years of clothes between this closet and 2 others in the home. I left with 6 black garbage bags full of clothes to donate! The entire purge took 5 hours. This particular closet was about 2 hours of work. Master Closet: Streamlined Living was able to get more use out of the storage areas in this one bedroom apartment! It took a little over 2 hours to streamline this closet.